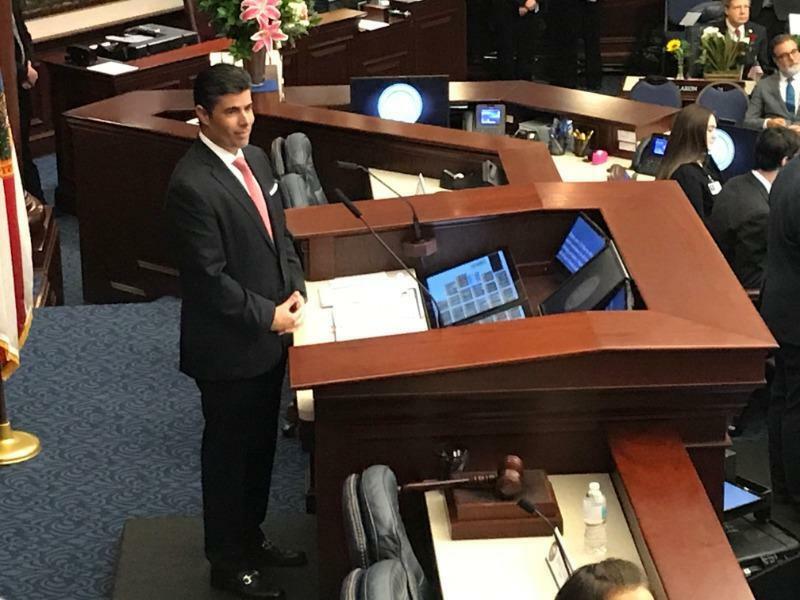 The Florida House on Thursday began trying to sweep away controversial health-care regulations, approving a bill that is a top priority of House Speaker Jose Oliva, R-Miami Lakes. Oliva and other House Republican leaders maintain that ending “certificate of need" regulations, which limit the number of hospitals, nursing homes and hospices that can be built, is a key step in holding down health-care costs. One of the criticisms of the program has been that it protects hospitals, nursing homes and hospices already providing services and makes it difficult for new providers to enter the market. The bill (HB 21) cleared the House in a 77-33 vote that was mostly along party lines. Leading debate against the measure was Rep. Evan Jenne, a Dania Beach Democrat who spoke for nearly 15 minutes. Jenne relied on the findings of a study in the journal Health Affairs that said many of the nation’s top price-gouging hospitals were in Florida. He contended that for-profit hospital companies that were singled out for price gouging would be positioned to take advantage of a repeal of the so-called CON regulations to open new hospitals in the state. “Forget about the fox guarding the hen house, we’re just opening the door and letting it right in,” Jenne said. But bill sponsor Heather Fitzenhagen, R-Fort Myers, pointed to “spurious correlations” in the arguments made against her bill, including Jenne’s argument about price gouging. “Assuming that’s correct, there are price gougers in the state, more competition is going to eradicate that because that’s exactly what removing CON will deliver …. more competition in the marketplace,” she said. The House bill in opposed by the state’s nursing home, hospital and hospice associations. Emmett Reed, executive director of the Florida Health Care Association, issued a statement following the vote promising that his nursing-home group will continue to lobby lawmakers on the issue. “Repeal of certificate of need requirements in other states has done real harm to elder care there. Indiana saw new centers being built but beds going unfilled, which put a significant financial strain on the state’s Medicaid budget. The state had to force nursing centers to close as a result and ultimately had to reverse its CON repeal initiative. CON also contributed to Texas facilities experiencing empty beds and poor levels of care,” Reed said. Under certificate of need, hospitals, nursing homes and hospices are required to seek approval from the state Agency for Health Care Administration before building new facilities or offering many new services. The process is supposed to help avoid costly duplication of health facilities and services, but it also has frequently led to legal battles about whether new facilities should be allowed. The House’s vote Thursday could set into motion negotiations with the Senate and, because the issue is an Oliva priority, could help determine whether this year’s legislative session ends smoothly. The issue has already hit a snag in the Senate, which in the past has been more reluctant than the House to do away with certificate of need. Senate Health Policy Chairwoman Gayle Harrell, R-Stuart, was forced this week to delay a vote on a CON bill (SB 1712) that she filed because she didn’t have enough support from committee members to move the measure along. Since the Health Policy Committee meeting, Sen. Aaron Bean, a Fernandina Beach Republican who was one of the opponents of Harrell’s bill, has been in meetings with the Florida Hospital Association and other senators about the proposal. Senate President Bill Galvano denied Thursday that the high-profile issue was being used as a bargaining chip in exchange for one of his priorities --- an infrastructure plan that involves building new and expanded toll roads. Oliva also denied that the issues were connected. Bean told The News Service of Florida that he is trying to look at Harrell’s bill in a “new light.” He said lawmakers might be able to change the CON process. “I’m looking at it from a point of view that it’s not a CON repeal, but a CON reform,” he said. Copyright 2019 Health News Florida. To see more, visit Health News Florida.